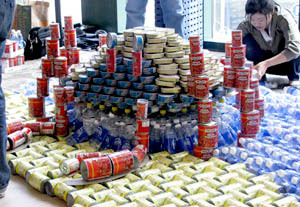 KITE Builds at CANstruction and Wins “Best Meal”! 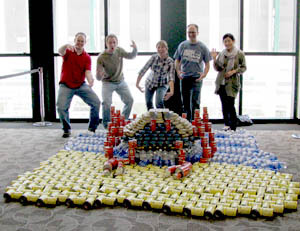 Architects from KITE spent Saturday April 10 building our entry for CANstruction along with Consigli Construction, and judges awarded the finished sculpture the “Best Meal” award. CANstruction is an annual event where architects and contractors build elaborate structures entirely with cans, with the food donated after the event to the Rhode Island Food Bank to help families in our community. Co-Captains Carrie Borges Patricio and Phil Derby designed a structure that captures a Rhode Island summer spirit – a crab at the beach! Su-Hyun Jenny Kwon from KITE also joined the construction team. Creative Environment Corp. consulting engineers is a co-sponsor of the team with KITE and Consigli Construction, with additional contributions from Pella Windows; Jutras Woodworking; Gene Fournier, Product Representative with Shaw Carpets; and Reece Tormos, Designer at Rhode Island Design Center. Thanks go to all our partners for their support of this fun, yet important way to help others in these tough economic times. Finished structures will be on display at the Providence Place Mall until April 24th, and there will be a public gala and awards ceremony on April 22nd at 6 pm.